In Finland I fell in love with a guy. It happens. What doesn't happen so often is that you fall in love with a magazine. I did. 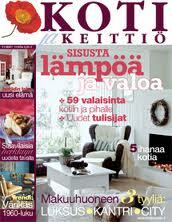 My Finnish boyfriend's mom introduced me to a magazine called Koti ja Keittiö. It was love at first sight. The cover! The houses! Interior decorating tips and ideas! All that and recipes! The perfect mix for a girl who is interested in many different things. So, when we moved to Ireland and I met Miss Mo our friendship got even stronger when we found out we both love interior decorating magazines. We developed a system. We would both buy different interior decorating magazines and after reading them we would swap them. That way we saved money (Miss Mo and I are a bit cheap) and we got to discuss things we both had read and seen. Win-win! 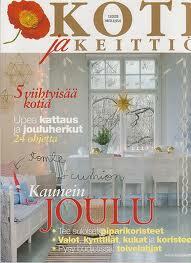 I have read many interior decorating magazines since and I must say that Koti ja Keittiö is special. Your first love usually is. I just love Finnish people's minimalist, practical and fuss free style. My mom is a total hamster, saves everything and hates throwing things away so my parents' house is full of stuff. L and I lived in my parents' house for a while and he always says that he gets a head ache when he looks at all my mom's 'treasures'. I guess that's why our house has very little stuff in it. And I must say I really like it this way. Easier to clean! Maybe there is another magazine I could fall in love with so tell me what is your favourite magazine?